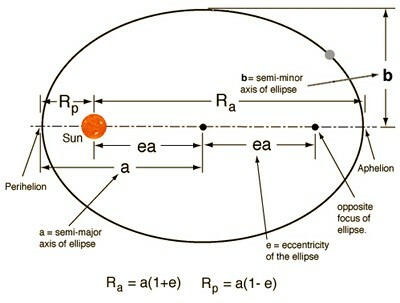 All planetary orbits are ellipses with the Sun at one of the two foci. 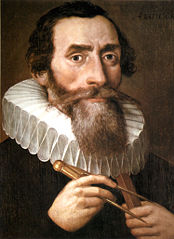 An ellipse is defined as the locus of points, the sum of whose distance from two fixed points ( the foci ) is constant. That is, an ellipse is a special curve where the sum of the distances from every point on the curve to two other points is a fixed constant. 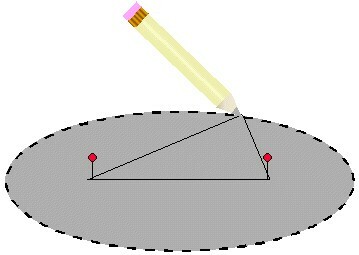 An ellipse is drawn by using two tacks into a piece of cardboard with a taut string and by moving a pencil held just inside the string. The closer together which these points are, the more closely that the ellipse resembles the shape of a circle. In fact, a circle is the special case of an ellipse in which the two foci are at the same location. Where the two tacks ( foci ) are come closer, the ellipse will approach a circle. In fact, every circle is a special case ellipse where the two foci are identical. e = eccentricity of a circle = ea/a = c/a = 0. See below for this definition.